So, I was thinking recently about how if you have a stack of neodymium magnets and then take another stack of neodymium magnets and place them perpendicular to each other with one stack pointing to the middle of the other stack and depending on the pole facing the stack of magnets pointing into the middle of the other magnet stack is going to want to go to either end of the the other stack its in the center of due to the magnetic fields. An example of this is shown in the attachment below ("explanation.jpg", which I spelt wrong in the file name...). So what if you took a bunch of magnets and cut them into wedges so you could stack them into a circle just as seen in the attachment below ("magnet ring idea2.jpg") Then took another magnet and held it perpendicular to the outside wall of the ring magnet you made out of magnet wedges. 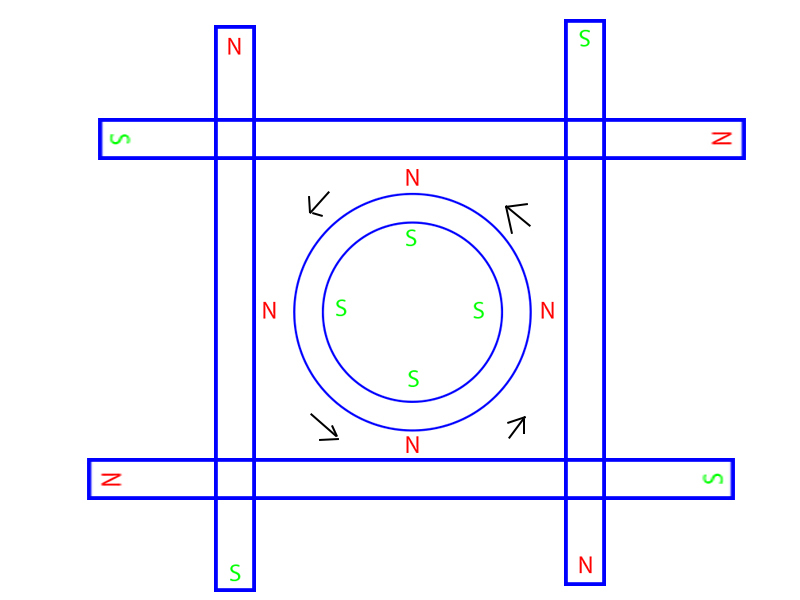 Wouldn't the magnets outside of the ring pointing in perpendicular to the wedge magnet ring magnetic fields drag the ring of magnet wedges in a direction based on the pole facing due to the explanation above? Then couldn't you just put the ring of magnets on a rotor and use the outside perpendicular magnets to spin it on its own? Then if you want to go a step further put induction coils in the system to generate currents? I just don't know if being that it is a connected ring of magnets if it would still work the same way as just a stack of magnets. Actually I don't think that would even matter because the field line I drew around the outside would be a field line in a circle going around the whole thing which could be used to turn it. I was looking around online and can't seem to find any rings of magnets that are even magnetized in this way... in-fact all the wedge magnets out there when I look for wedge magnets on google aren't usually magnetized along that axis in the magnet wedge from what I can see... they always seem to be magnetize up down... was thinking I'd buy a bunch of cheap ceramic magnets and just cut carefully cut them into wedges to test the idea. I honestly don't see a reason this wouldn't work as long as the fields are connected equally meaning equal wedge magnet sizes with all uniform magnet strength so none of the magnetic fields "leak" if you want to call it that. Alternatively I think you could get a similar result by using the opposite of the design above and not have to use wedged magnets in a circle. Use a magnet ring that's radially magnetized (one pole inside of ring one pole outside of ring) Then place magnet stacks that are long enough to run along the sides of the ring. Use 2 fairly long magnets one with north facing up one facing down or just in opposing directions. The rings outer poles should want to travel towards one end of both of those long magnets or stacks of magnets and because the entire ring has a pole facing outwards it should spin right? Actually could probably take those two smaller bar magnets and just extend them out instead of connecting them to the larger ones. The north on the ring magnet in the center will always want to seek the south pole of the bar magnets as long as those outside bar magnets are long enough I don't think there would be any sticking due to encountering the north poles of those magnets, might even be able to connect the ends of the bar magnets together using metal or more magnets so the flux "ends" are directed through the bar magnets entirely, then if it works just wrap coils around the stator magnets. I tested this particular configuration because I don't need wedged magnets to test it... it seems like it wants to work, but I wasn't using a perfect ring magnet in the center just a bunch of magnets with the same poles pointing out, I'm going to try and add more to the center so there's more magnet poles facing outward from it. 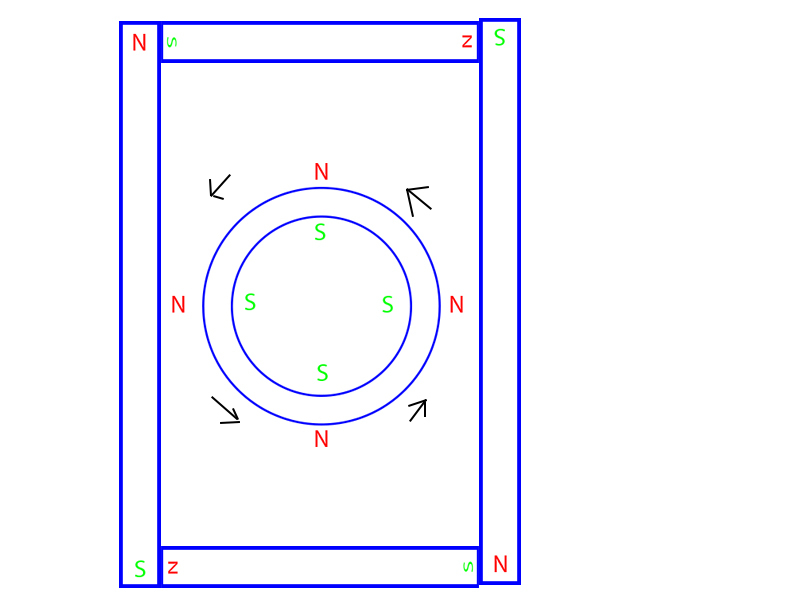 The best configuration might just be a perfect ring magnet with a wedge ring magnet so the poles are complete around the entire circle on both of them with the poles being perpendicular in direction to each other like above but instead of magnet bars on the outside you use a full ring radial magnetized magnet with one pole facing inwards interacting with the wedge magnet ring. I came up with one that produces a positive torque, but its not exactly anything worth while... about 23 mg of force, barely enough to move itself assuming you have something with little enough friction to mount the central magnets on (floating magnetic bearings lol?). Also the wedge magnets need to be on the outside for it to work best because you end up having fields intersect where the magnets connect more so around the outside of it (kind of hard to explain) but it basically produces some negative torque on it because of this... but after adding everything up it amounts to like 23 mg of force pushing the "rotor". EDIT: This won't work. The problem is exactly what most people told me, the majority of the magnets flux gets sucked into the magnet itself at this point since almost all of the flux that flows around the magnet stems from the ends and loops back through itself. When they connect together almost no flux lines flow along the sides of the magnets and the flux simply gets sucked inside it. So this is another dead end. I ran another idea I have through FEMM since I've never really used FEMM before now, and that actually might be capable of producing usable torque, but so far I've only got very low quantities of about 2 Grams. It would take more than that just to spin itself but I think I can add more to the rotor and stator to increase that value with minimal weight being added and adding minimal amounts of friction to it. Of course idk where that will ever go in terms of power output.